Don’t stay here during the week. My wife and I recently stayed at Kohl’s Ranch Lodge. We checked in on a Wednesday and checked out the following Friday. Upon check in we were informed that the only food service, during the week, was dinner in the Saloon until 8pm. Breakfast, and lunch were only served on the weekends. The main restaurant, Zane Grey’s was also closed during the week. The menu in the Saloon consisted of pizza and barbecue. If you wanted anything else, you would have to drive miles to the nearest restaurant. We dined in the Saloon both nights we were there. The entire staff consisted of two guys. They made drinks, took orders, cleaned tables – they did everything. They were great guys and gave it their all. But, it just could not work. The first night we got the wrong pizza. They were so busy with other customers that we just ate the wrong pizza we were served. They were “sorry” but no offer to discount our wrong order. But, the pizza was quite good. The next night we had a barbecue. Again, the place was packed and serviced by just the same two guys. Food was late and arrived cold. Another thing to be aware of is housekeeping is only done once a week. So, if you’d like fresh sheets or towels plan on visiting the laundry on site. It also appears that most other services are curtailed during the week. The putting green was so full of leaves that the cups were filled to the tops. And, no putters or balls were to be found. There were also pool/spa issues while we were there that forced the closing of the pool/spa at dusk. All of these services were, supposedly, covered by the $10.00 per day resort fee. It just seems that you are paying for a lot of things that you are not receiving. And, it was the first time I’ve ever been charged $2.00 for a USA Today paper at any hotel. All in all, it appears that Kohl’s Ranch Lodge has become an ageing timeshare property that will not provide proper staff or services to make for an enjoyable stay. 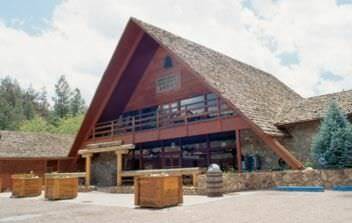 There are other places to stay in the area and I would recommend researching them before settling on Kohl’s Ranch Lodge.